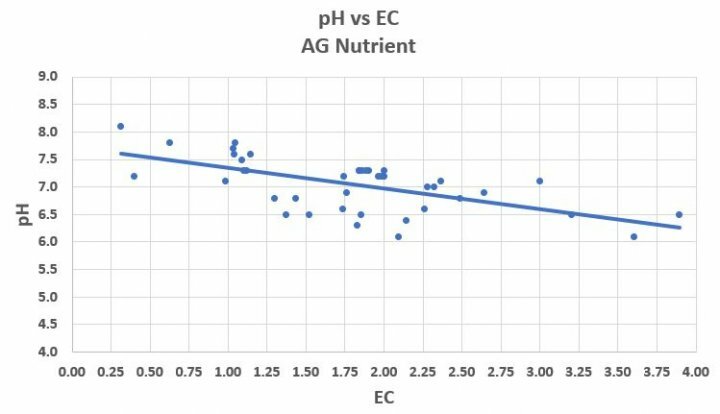 I’ve been using AG nutrient for several months and have been measuring EC and pH. What I’ve found is that is that if your EC is below 2.0, your pH is probably above 7.0. This is shown in the attached graph, which is a composite of data from the Bounty Elite, Sprout LED, and Farm Plus. The results should be relatively independent of the type of AG used since it is dependent on the water chemistry and not how much water is in the AG. Peat’s Guide recommends pH values between 5.8 and 6.3 for AGs. Based on these results I’ve started using pH Down to try to maintain a pH of 6.0. I’ll post data on pH down dosage once I gather it. I’ve measured the EC with a Hanna Primo TDS tester and a Hanna pH Checker. The Primo TDS tester is $37 and the pH Checker is $41 on the Hanna website. Both can easily sample through an unused pod hole.